this sport fishing boat built on an Airstep ® hull has excellent sea-keeping. Keen anglers immediately relate to this boat, which has all the essential equipment. 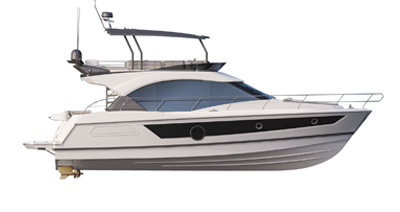 Available with or without a flybridge, the ‘two side door’ version features a three person seat, under which a small galley is concealed. The three door version has a three-leafed glazed door to stern. On this version, the galley space is located opposite a fold-away portside seat. The modularity of the various equipment and fittings offered for fishing gives you great latitude as to how you use the boat. The side seats can be folded down and the additional cockpit seat slides forward and back and holds an additional fish bin. The bench seat and two forward seats are removable. Lastly, the boat is equipped with rod holders, a live bait well, a large central locker and two side lockers. CE Certification C8 - maximum 8 passengers on board. Fishing trim: "Barracuda Tour" decoration, deck wash pump, 6 rod holders (2: transom, 2: freeboard, 2: bow), live bait well (starboard aft). Single or twin outboard engine - maximum power 300 HP - Holiday pack Suzuki engine. Flybridge driving station (electronic controls only): 2nd control station, copilot seat, ladder, cushions and hand rails. 11 US Gal fridge and sink on option. Direct access to cockpit by aft three-leaf glass door. Seats for 3 people and fold-away round table. Pilot and co-pilot seats can be rotated so that 5 people can sit around the table. Separate toilet compartment on option.